Sorry to kind quit still in the middle of the weekend, but I thought, whoa, I am tired just reading this, and went to bed. Woke up Monday morning feeling not rested at all. However, it wasn’t snowing, so that was a bonus. So, I forgot, on Friday night I made spaghetti. Not an outside of the normal occurence, but I have to explain how Ken’s family eats spaghetti. I have no idea how this evolved. In my family, we made our spaghetti with a pot of cooked noodles, cooked hamburger dumped in, and jar (usually home canned while I was growing up) of tomatoes and only ½ packet of spaghetti sauce seasoning because otherwise it was too spicy for my father. (I am pretty sure I love spicy food so much now because I was repressed for so long….) Oh, and slices of Velveeta on top, then put the lid back on the pan so it steams and melts the Velveeta. Mmmmmmm. Velveeta. My nephew (Iowa nephew aged 6) calls Velveeta slices “Grandpa cheese.” I am sure you can tell why. OK, so I don’t even remember how I made spaghetti when I was out and about on my own, I don’t think it was something I cooked very often. But when I met Ken, I met a new way of making spaghetti. Here it is: Brown the hamburger. Cook the noodles. Warm up the sauce (or make homemade sauce.) Have ready: grated cheddar cheese, and cottage cheese. Do not combine anything before serving. Here is how you make your plate: Spaghetti, then sauce, then hamburger, then cottage cheese, then cheddar cheese. If you really want to go on a cheese o rama, then add some parmesan. Regardless of how odd this is, it is actually pretty good, the cottage cheese creates something like a lasagna effect. I imagine it is something like Cincinatti chili/spaghetti, but I have not had that (yet). After lunch on Sunday of course we had to watch the Broncos game. Well, at least until the third quarter, which is when Ken was so annoyed with them he gave up and turned the TV off and came upstairs to wrap Christmas presents. BUT I was supposed to keep listening to them on the radio, just in case something happened. (It would have taken a miracle on a par with a rain of toads for them to pull out a win this week, but really, stranger things have happened.) I had decided at halftime that I had better get going on the yo-yo pillow or it was never going to get done. Well, it still looks like it might never get done, but at least that gift is for the 6 month old who will not know the difference if she doesn’t get it until March. Her mom has already given me the out on that. Monday night I finished sewing on the yo-yos but I also stabbed myself and bled on it. Did manage to get the bloodstain out, but I think that gift is going to arrive after Christmas. But of course I still have a million things to do before Christmas, and would like some time in there to bake some cookies, ha ha ha, I don’t even have my share of the Christmas letter written yet. And then we went out to dinner with friends from SD who had come down for the game. And then we went to WalMart. And then we went to Safeway. I woke up Monday morning feeling like I hadn’t had a weekend at all. Oh, but I only went to JoAnn fabric 3 times, not 4, I miscounted. We also washed the 2nd rotational set of flannel sheets and changed them. This set is threadbare, whereas the other set is less threadbare but has a hole in them that I need to patch, since Ken keeps sticking his toe in it. I think we are going to ask for a gift certificate for new flannel sheets and bedding, because that is just how exciting it is around our house. I should make us a quilt for our bed, but we are last in line behind all the gift quilts I like to make. We are using an older and rather strangely colored quilt right now (which does have sentimental attachment to me) but we used to use it primarily because we had a cat that barfed a lot, and we didn’t want a quilt on the bed that we cared about him barfing on. 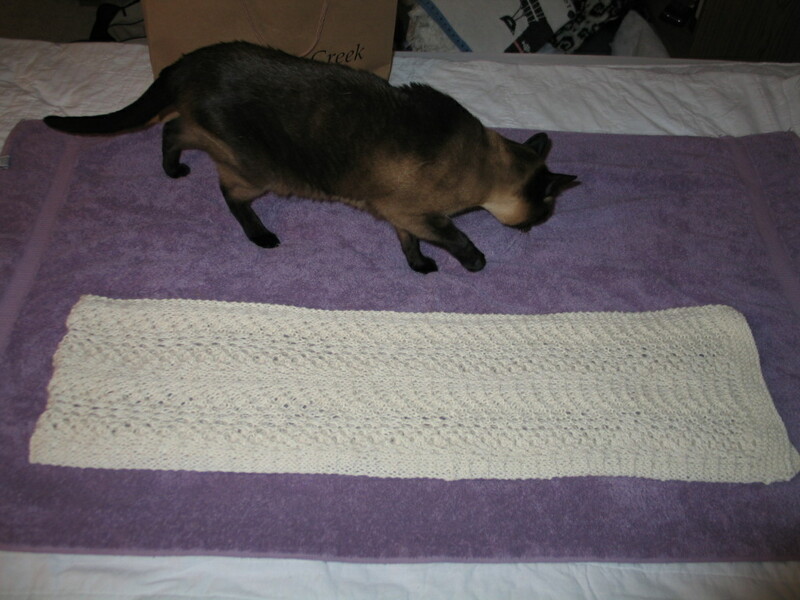 Simon, helping with my knitting pictures, not barfing. Well, Simon has been gone now, what, two years, so maybe I can spring for a comforter, and maybe sometime get us a quilt made. (To match the poppy print on the wall. Which isn’t hanging up yet but is sitting at the top of the stairs.) I guess I do have some of my ancestors’ frugual genes – I give my mom a bad time about using something that is chipped or worn, but I don’t hesitate to do it in my own house. Double standard! 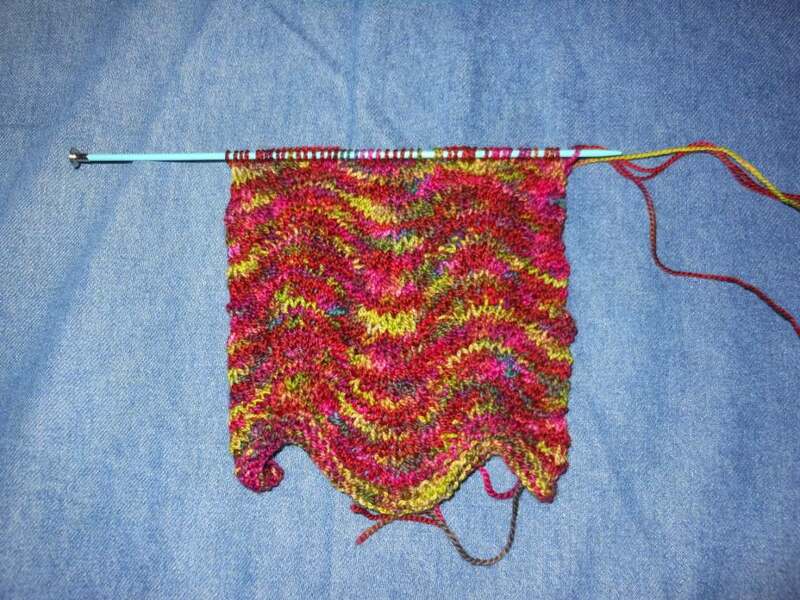 So, at the knitting Christmas party, and during the 1st half of the football game, I was working on a NEW project (hello, once again, easily distracted by NEXT project.) 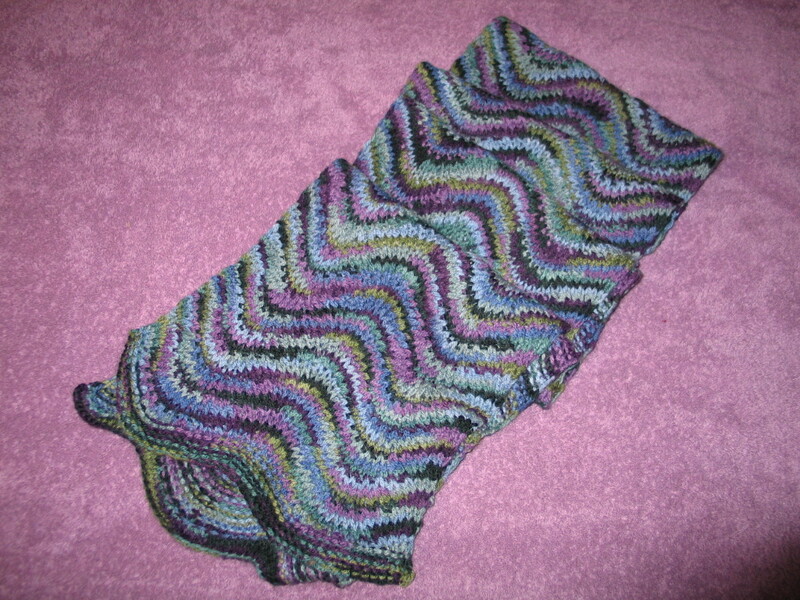 This is the Chevron Scarf from Last Minute Knitted Gifts by Joelle Hoverson. I have made this three times already, but in worsted yarn, and have given them all away. This one I am making with a very cool Sophie’s Toes Magic Ball from my friend Cathy, which is actually sock yarn, and I am KEEPING IT, darn it. Grandpa cheese–that is great. I will pretend not to know about the bloodstain. 😉 You can always send an empty box for Anna, she would be perfectly happy with that. I could’ve picked up some cheap sheets at Yonkers on Black Friday for you and you could’ve packed them in your hillbilly suitcase.